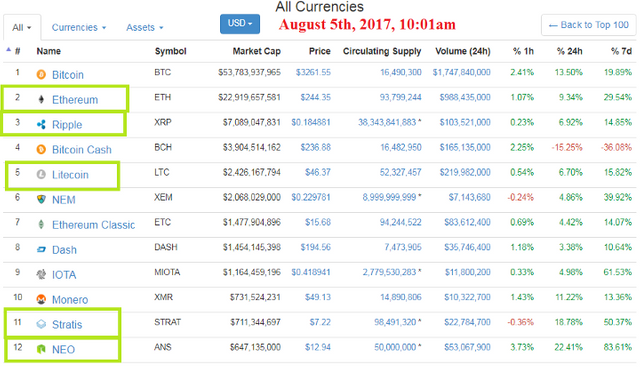 CoinMarketCap as of 9:55am PST on August 5th, 2017 shows a Bitcoin price above $3,200. This is history being made before our very eyes, Bitcoin has always been the cryptocurrency to make the most noise — now it’s literally bringing growth to the entire market. Bitcoin just passed $3,100 last night. Bitcoin is a “bottle neck coin,” meaning we have to purchase Bitcoin in order to purchase 90%+ of the other coins on the market. With the recent booming of ICOs/Token Sales and blockchain-based businesses alongside the recent fork of the Bitcoin Network — it’s truly hard to tell why Bitcoin is hitting records daily, but it’s nice to see! 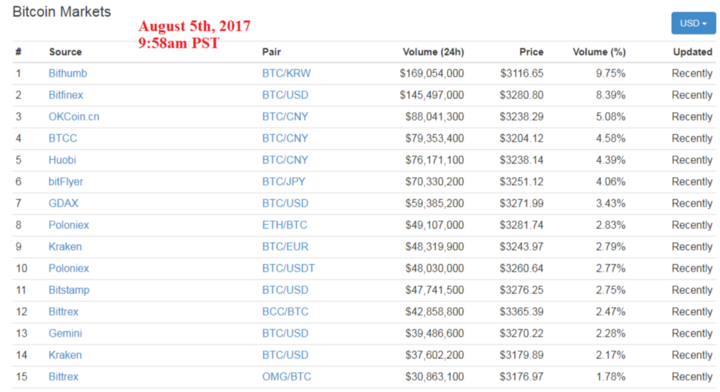 Taking a look at the picture above from CoinMarketCap, Bitcoin is blowing past the $3,200 figure across exchanges — will this continue? I’m not sure any of us can say for certain, but the price has increased three times since I started writing this article and is not at $3,261 on CoinMarketCap. Insanity. Ethereum has finally broken out of the $215–225 range and is above $240. Ripple is seeing some much needed growth after stagnating for some time — a modest 14% in the past 7-days. Litecoin has broken out of the $40–44 range it’s been sitting in the past few weeks. Stratis is a grower — I as listening to The Cryptoverse with Chris Coney and he mentioned Stratis being a proprietary product of Microsoft. I recently went out and purchased my first Raspberry Pi and am currently downloading the Stratis Wallet on it so I can begin staking with my STRAT! NEO, otherwise known as the Chinese Ethereum, is seeing explosive growth. This token was sitting below $7 just last week and is now flying past $12! It’s hard to determine if you should buy these altcoins now, or wait until the Bitcoin volatility is through. I’m not sure this will end anytime soon with the potential for Bitcoin to fork a 2nd time with Segwit in the coming weeks. There is a major chance for more volatility and Bitcoin growth. If Bitcoin Cash dies away, that money will likely flow into Bitcoin, boosting it another few hundred dollars from the BILLIONS that would flow into it from Bitcoin Cash. Share with your friends, the community, and follow along for more insight into the cryptocurrency markets! I’m here to update YOU with alerts and thought-provoking content. My goal is to help grow the community that we are all a part of, The Crytposphere! NovaExchange — the top exchange for ANY cryptocurrency — find the smallest, less known on this exchange first. CoinPayments - Receive payment via 55+ different cryptocurrencies - the crypto-PayPal.